Tucked away within the walls of the famous Lucerna building, a secession structure constructed at the onset of the 20th century, one can find several peculiar places. David Černý’s dead horse statue hanging on the ceiling is one of these, a literary café dedicated to Franz Kafka’s key literary hero Gregor Samsa, is another. When I see Samsa, tables casually placed in front of the café, and the local patrons chatting away while puffing on one cigarette after another, I almost forget I am standing in the middle of a passageway inside one of the most famous buildings in Prague. If you choose to sit inside you will be constantly teased by a plate full of chocolates, croissants and other goodies which have been sneakily placed on each table to tempt the customers. I particularly enjoy the look of their bathrooms where the walls are covered with snippets of old newspapers, containing funny ads as well as anecdotes. So if you are not shy about approaching someone in the bathroom do ask for a translation of some of them. The range of books they carry is limited and often Czech-only but the hand-picked selection is sure to offer something for everyone. They also have a decent selection of graphic novels, which you can choose from (try Alois Nebel, masterfully illustrated by Jaromír 99 or his new adaptation of Kafka’s Castle). 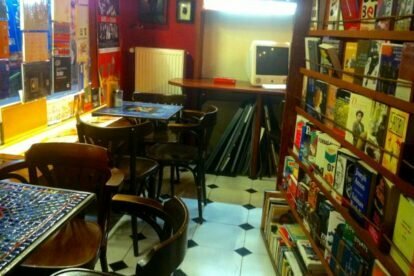 Café Samsa also offers different events of mostly literary character as well as exhibitions so stop by for some Kafka-esque magic.